MOLLUSCA : NUDIBRANCHIA : Fionidae SNAILS, SLUGS, ETC. 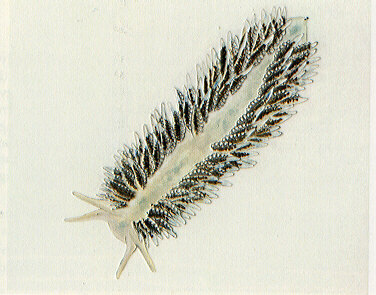 Description: This is another ocean wanderer like Scyllaea pelagica, which rarely turns up stranded on our shores. The body is pale fawn in colour with white speckling. The numerous cerata contain coloured digestive gland which may be brown if the animal has been feeding on goose barnacles or blue if the food has been the chondrophore Velella. Habitat: Fiona lives at the surface of the sea, feeding on goose barnacles attached to floating debris or on free-living siphonophores such as the By-the-wind sailor Velella. Distribution: The distribution of this species is circumtropical, found both in the Atlantic and the Indo-Pacific basins. It has rarely been found cast up on British coasts. Picton, B.E. & Morrow, C.C. (2016). Fiona pinnata (Eschscholtz, 1831). [In] Encyclopedia of Marine Life of Britain and Ireland.